What is "divestment"? Divestment is simply when an investor decides to sell their stock in a company. It's a decision that large and small investors make all the time, for all kinds of reasons.Why a divestment campaign now? A vast majority of Americans support common-sense changes in public policy while respecting the rights of lawful gun owners, but a small number of well-financed extremists have blocked the political process. Since funding is now driving the process, de-funding the industry has become an appropriate and important priority for those committed to sensible reform.How does a divestment campaign work? When many investors decide it's time to sell at the same time, that company's stock comes under pressure. Over time, a low stock price can make it harder for a company to get loans, finance sales, or expand its business. And if the pressure is high enough, an entire industry—even a national government—can decide it's time to change how they do business.How can divestment improve gun policy? As the public outcry over gun violence continues to escalate, influential investors such as university endowments have greater reason to reconsider the business, financial, and moral implications of their holdings in firearm manufacturers that refuse even modest changes in their products and practices. At the same time, individual investors may not even realize that they own shares in such companies through their mutual funds, retirement accounts, ETFs, or other products. As investors of all kinds become more informed of the risks involved, the potential for widespread divestment will grow—and with it, the pressure on the industry to change.Who is participating? The dozens of organizations that have joined Campaign to Unload to date include established national civic organizations, local grassroots groups, educators and students, and elected leaders. These voices come from urban, suburban, and rural areas throughout the country.Have divestment campaigns worked in the past? 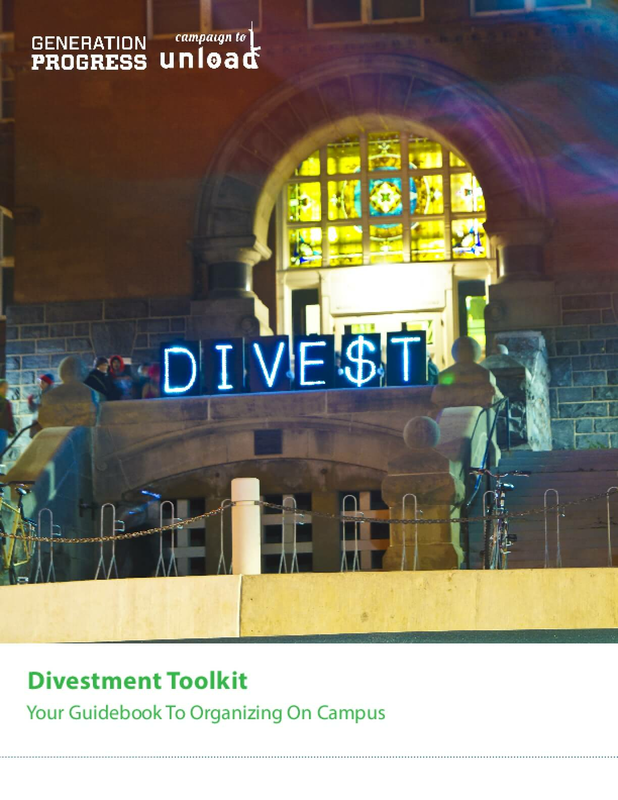 Because funding is the lifeblood of business, divestment campaigns have been essential components in some of the most successful changes in public policy of the past 30 years. These include changes in U.S. tobacco policy and the end of Apartheid in South Africa. Copyright 2014 by Generation Progress. All rights reserved.